More than 250 people are dead and more than 1,000 people injured after a strong earthquake hit a remote northwestern region of China this morning. The quake leveled thousands of homes and schools in the Xinjiang province, located about 3,330 kilometers west of Beijing, near China's border with Kyrgyzstan. People in the provincial capital Urumqi, more than 1,000 kilometers to the northeast, also felt the tremors. 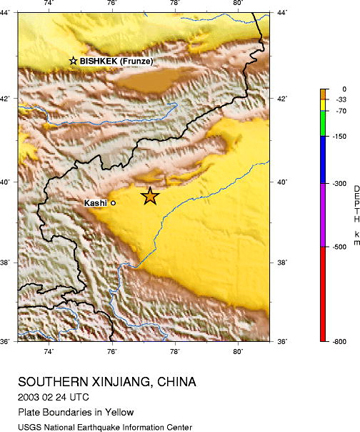 Although the U.S. Geological Survey measured the quake's magnitude at 6.3 at a depth of 33 kilometers, Chinese officials are citing the earthquake at magnitude 6.8. Earthquakes are common in this area, which includes the eastern foothills of Central Asia's Pamir and Tianshan mountains; however, casualties have historically been rare, because of the province's sparse population. According to the Associated Press, China's Cabinet authorized the release of emergency funds. And Chinese leaders ordered local officials to provide survivors food, water and shelter. Some heavy rescue equipment has arrived in the area, but many rescuers are still working by hand. And visit the U.S. Geological Survey for more on this and other, historical earthquakes.